The Dickinson Journey: Baby Jeremiah: Good News! 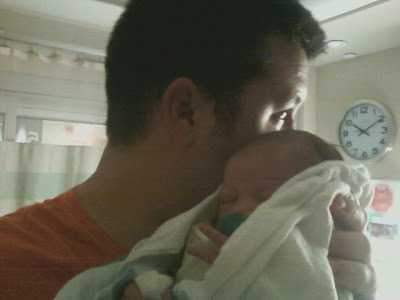 Yesterday baby Jeremiah got out of NICU and got to stay with Daddy and Mommy, and the whole family got to be together! Michael said that little Isaiah and Sophia were doing their best to love their baby brother to death. I understand that later they will be seeing a specialist regarding his hemangioma. But today they should get to go home from the hospital! Praise the Lord! We so appreciate all your prayers. Dad said Michael & Beth's house will be one loud place tonight. Poor ol' Bethie will likely ask Michael to please take her back to the hospital. Smile. I hope they are able to quickly adjust to their new routine. Now, I'm going to try to find your post on 'Springtime'. I just read that post on my google reader and I wanted to comment on it.